THE PROPER WAY TO PREP A STAINLESS STEEL LINER FOR POURED IN TYPE INSULATION. 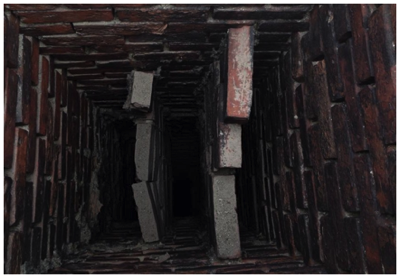 This is one of the most common things a chimney sweep in Massachusetts sees, it is very dangerous to use a chimney in this condition. Also notice the lack of mortar between the bricks in the outer walls of the chimney, the mortar has worn away almost completely. First, aluminum liners are very thin. They can easily be crushed in your hands and can be pierced with a pencil without even breaking the pencil’s tip. So, when run down a chimney an aluminum lining will quickly tear open if it’s rubbed roughly against the masonry inside a chimney, this is common and can not be helped. A torn liner is no good, how will the consumer know if the installer ruined the aluminum liner when he pulled it down the chimney? Second, many heating system manufacturers for both furnaces and boilers plainly state in the owners manuals of their systems that aluminum liners can not be used. This is usually due to the fact that an aluminum liner will rot out in a very short period of time because of the corrosive moisture that is a by product of both gas and oil combustion. Even if a manufacturer were to allow aluminum linings for a system, we are seeing these fail in the field in an average of 5-7 years. Liner failure creates a dangerous condition where products of combustion can leak out of the chimney and into the home causing a health and safety hazard. Third, aluminum liners can not really be swept properly because you can only use a soft nylon duct brush and that won’t remove any stuck on build up, putting a standard wire chimney brush through the lining would puncture and / or tear the aluminum liner. Most self respecting chimney companies will not install aluminum liners for these three reasons alone. Lastly, many homeowners are misled with the promise of a lifetime guaranty only to find out that the guaranty only covers the parts, which are cheap (typically under $200) because aluminum liners ARE CHEAP! The majority of the money customers pay for an aluminum liner install is profit and labor! (Unlike stainless and cast liners which the material costs are a high percentage of the job.) The other thing about these guaranties is that they are contingent upon a yearly inspection. If you don’t pay for and get your yearly inspection done EVERY YEAR your warranty is over. It is very important for the proper operation of any heating system appliances connected to a chimney that the liner diameter be sized properly (whether the liner is to be stainless steel or aluminum). All too often we see unscrupulous companies just putting in the size liner that fits down a chimney without any modification or additional work. Unfortunately this can put the homeowner at serious risk to health and safety when the appliances don’t vent or operate correctly. It would be a good idea for the consumer to know the height of their chimney and the BTU’s (gas) or GPH (oil) of all the appliances going into the chimney (BTU or GPH is printed on the heating system) then ask to see the sizing charts or slide rule before you allow a company to put in a heating system chimney liner. Many chimney companies that don’t offer cast in place lining (because of its high start up costs to a business) only offer stainless steel re-lining which is never a good option for an un-lined fireplaces because of the smoke chamber tie in (see the 6th - 9th bullet points at the bottom of the page for more info on the smoke chamber tie in). Chimney Savers does use stainless steel liners for many applications (we love lightweight stainless steel liners for gas and oil furnace or boiler heating system linings, heavy duty stainless steel chimney liners (always insulated for solid fuels) for wood-stove, and insert linings) but, in an unlined fireplace the liner must have an air tight connection to the smoke chamber, and this is not possible with just metal connections and collars around the base of the stainless steel liner. Trying to seal this seam by typical stainless steel lining methods will not last and will always fail, for these applications Chimney Savers does a full cast in place lining (the ONLY exception is to use a combo cast in place lining in the smoke chamber and then cement style insulation around a stainless steel liner). The common failure of stainless steel in fireplace relinings is due to the different expansion rates between unlike materials (metal vs. masonry) it won’t even matter if they use a high heat based masonry or ceramic product (again the only exception is a solid casting for a smoke chamber and solid cement style insulation around the lining), any other way it is still going to expand at a different rate than the metal it touches, it will always crack and fail due to thermal expansion. The connection will then allow creosote to get between the new stainless steel liner and the chimney wall causing a fire hazard that no-one can even see! Unfortunately our technicians come across this type of problem all to often and it’s usually after a damaging chimney fire has occurred. Cast in place fills the chimney solid so there are no voids for creosote to fill. Wood fueled fireplaces (and wood-stove / inserts) also require that the stainless steel liner be insulated, yet we hardly ever see other companies do it because of size requirements. To make matters worse the cement type of liner insulation must have spacers installed on the liner so as not to allow the chimney wall to touch the stainless steel chimney liner at any point (SEE PHOTOS AT BOTTOM OF THIS PAGE) because of dangerous heat transfer issues, unfortunately for consumers very few installers follow this rule. Once again cast in place chimney liners (or cast smoke chambers with cement style liner insulation around a stainless steel liner) solve all these problems. 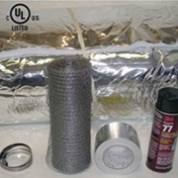 Another great option for wood-stoves and inserts is to use a pre-insulated double wall chimney liner, just be sure that the inside wall is made from a heavy duty chimney liner (see fourth paragraph under the next section "comparing stainless steel liners to cast in place lining" for maintenace failure issues of lightweight stainless steel liners in solid fuel applications). burning does not take place. liners, are not affected do to their composition from volcanic rock. pricing never mind what type of liner fits your application best. Don’t think that because you have a lifetime guaranty on your liner that your covered, because the unavoidable damage that would result from removal of a creosote blockage in one of these cheap liners is, of course, not covered and now you need to buy a new liner and have it installed. You should also read the fine print on any stainless steel liner guaranty. It says you must have the chimney inspected and / or swept every year and have proof to that effect (which is the right and safe thing to do anyways) and if the manufacturer does find that you in fact have a valid warranty issue, (usually this will only happen for a corrosion issue) you only get the liner parts, not any reimbursement towards installing the replacement liner. Don’t misunderstand me Chimney Savers installs all types of liners, we just educate the consumer and recommend the right ones for the particular job. 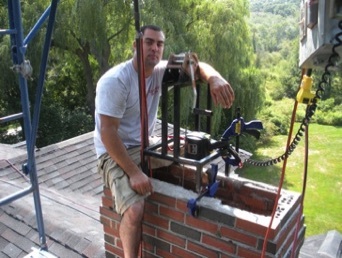 We are in fact the only company in our area who even offers all the types of liner services such as: full clay tile removal and replacement (using new clay tiles or another lining system), full removal of brick flue divider walls, cast in place lining, stainless steel lining, flue coating / sealant and complete reconstruction of entire chimneys. So, light and medium duty liners have their purpose and we do recommend the installation of them in such applications as furnace chimneys in excellent shape, and we do have customers that have these types of liners and wood applications with no problems, but they are sure to sweep them yearly and are very careful about what they burn (seasoned hardwood, that they season and protect themselves because when you buy “seasoned” wood it rarely is. Also get to know your types of wood because some unscrupulous venders mix in softwoods). One of the most common problems we see with re-lining in stainless steel is when it’s done in un-lined multiple flue chimneys. The brick divider wall between the flues is commonly falling apart and bricks fall down the inside of the chimney, unfortunately we see this happening all the time to people that just had a stainless steel liner installed by another company in a chimney with this condition, the sad consequence is when a brick lands on the liner after falling 10, 20 or more feet and tears or dents the stainless steel liner effectively ruining it, thus requiring replacement. Even more sad is when the customer realizes that their lifetime warranty doesn’t cover a chimney brick falling on the liner and now they have to pay for the whole thing all over again… every single time this has happened they get the cast in place liner, or a solid cement style insulation which of course, either of those more expensive options would have solved all of those problems the first time. 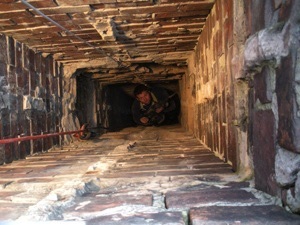 When contemplating the repair of a chimney, there are, unfortunately, many considerations which do not become apparent until after the work has been completed and the contractor is long gone. 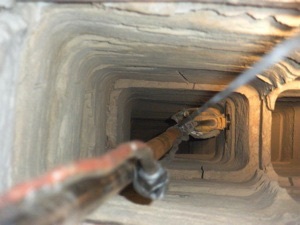 This frequently occurs as the result of misleading or misinformed analysis of the damaged chimney. 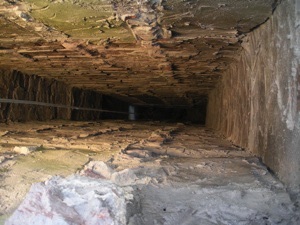 For instance many chimneys that have interior damage to the flue are lined with just stainless steel liners which provide no restoration or strengthening of the chimney structure, in these circumstances (which are very common) cast in place liners should be used, because they add structure to the chimney. It is all too true that when repairs are being discussed, one concern, regretfully, attracts more attention than others, price. The question that is often overlooked and only considered after the job is completed and the contractor departed is the fitness of the repair to work properly with the original appliance such as a fireplace or furnace. The time to ask questions about the fitness of the repair is before work begins. Unfortunately, many repairs reduce the diameter of the flue so that the original appliance no longer vents properly. When this happens, the fireplace, for example, will not vent properly and the smoke will come back into the home. At this point, the cost of the repair is no longer a factor. It is at this point that the bitter taste of poor quality remains long after the sweet joy of low price is forgotten. This decrease in flue diameter size happens with regularity when a stainless steel liner, for example, is improperly installed for the original appliance. 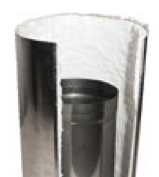 Remember, when a stainless steel sleeve is inserted into an existing liner, the diameter of the flue is instantly decreased, and any structural problems become hidden. Is this a real fix to the problem or just a cover-up? This is what happens when price is the primary concern. To make matters worse, all metal liners have issues with heat transference and maintaining stack temperatures, so make sure that if you are going to get a metal liner and use it for a solid fuel such as wood that you get liner insulation around it. In fact, when a metal chimney liner is installed, it is required by Underwriters Laboratory (UL) to be insulated on the outside of the liner. The National Fire Protection Association standard 211 (NFPA 211) also requires all liners to be insulated around the outside. Firstly, insulating the liner prevents heat transfer – the number one cause of structural fires from a chimney - to the outer walls of the chimney. Additionally, insulating the liner contains the flue temperature within the liner thus producing a hotter flue temperature which naturally increases the draft of the venting system. 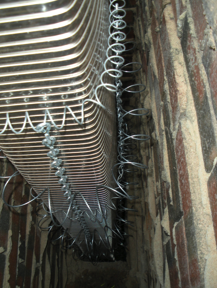 It is a sad fact that most steel liners that we have seen installed have had no insulation. This will leave both the homeowner and the insurance company with a false sense of security. And insulating half-way around the liner is definitely not the answer because of dangerous heat transfer issues! All this leads to the observation that if you wish to restore or reline a chimney, the cheapest solution is never the best solution (and may not even be legal). •Cast in place systems have been in use for more than 75 years and have demonstrated their superiority. •Stainless steel liners have only been around for a little over two decades. •Pumped Masonry Cast in Place Linings are centered in the flue using specially designed spacers to keep the former off the chimney walls and assures complete coverage throughout the chimney. •Stainless Steel and Alloy liners are very difficult to center in the flue, if insulation material is a poured in type most installers will not use spacers and the liner will be pushed up against one side of the chimney wall resulting in areas with no insulating protection. (SEE PHOTOS ABOVE FOR PROPER INSTALL). Using a preinsulated double wall stainless steel liner solves this issue but can be a size issue for a lot of common applications (to big to fit in the flue). •Pumped Masonry Cast in Place Linings provide structural strength to deteriorated or cracked casings, fills open joints, seals crumbling mortar. •Stainless Steel and Alloy liners alone provide no structural strength to the chimney. (Unless done in conjunction with a cement style insulation. Be careful most installers do not install cement style insulation properly - SEE PHOTOS ABOVE FOR PROPER INSTALL). 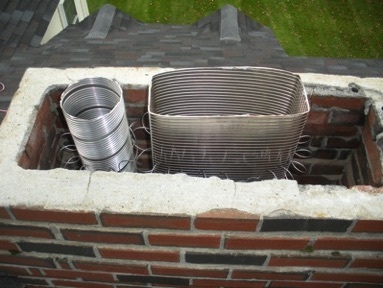 A preinsulated double wall stainless steel liner DOES NOT help with any chimney structure issues. •For Fireplaces - Pumped Masonry Cast in Place Lining will line the fireplace smoke chamber, protecting the flue for its entire length, this makes an air tight connection between the liner and smoke chamber because they become one single casting (not even possible with just a stainless liner and the air leakage is a fire hazard). •Pumped Masonry Cast in Place Lining experiences minimal expansion and contraction from flue heat. 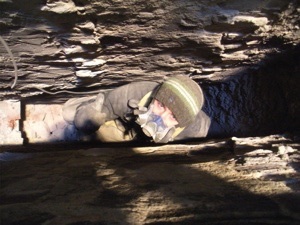 Also smoke chamber and flue are of the same material. •Pumped Masonry Castings have been tested by Underwriter's laboratories and Warnock Hershey to withstand temperatures in excess of 2100 degrees. •Stainless Steel and Alloy liners subjected to the heat of a chimney fire, loses their "stainless" properties, opening the door to rust and corrosion. 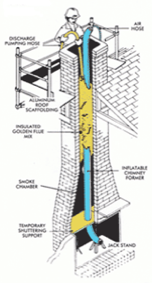 •Pumped Masonry Castings are the only lining system tested and approved for safety after multiple chimney fires. •Building codes require that any metal components in a chimney be inspected after a fire for possible replacement. •Pumped Masonry Castings are certified for use with all fuels: oil, gas, wood, coal. •Different grades of stainless steel and aluminum must be used for different fuels. A future change in fuel may require another relining with a different alloy.